It’s Mud Season, and to many of us, it brings a sense of peace as the town finally empties and the locals come out of the woodwork to reminisce on this winter’s snowstorms. But Mud Season to this author also means Desert Season, and riding your bike on the endless trails in St. George and Moab, and everywhere in between. 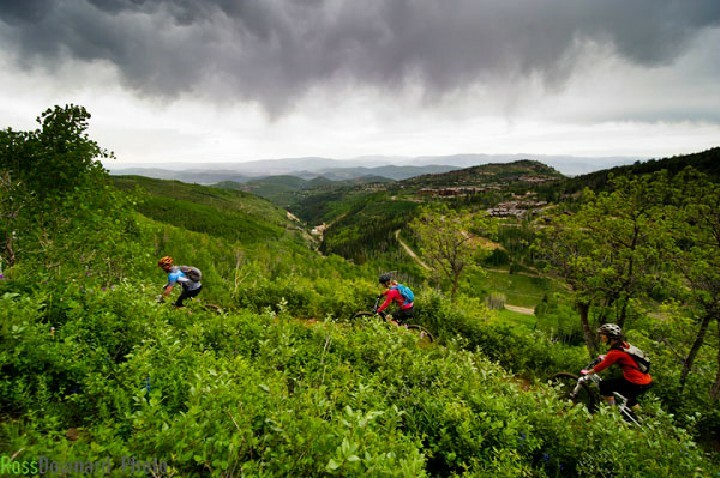 We’ve compiled our top five favorite rides in southern Utah. We’re sure you have your own as well. But, if you’ve never been or just ride the same old stuff, try these trails to freshen things up. We also reference and link to the rides on the Trailforks website to provide additional information beyond our summary and for future easy reference. The Zen trail is a classic Southern Utah ride. It’s got everything you want—slickrock, a fun and fast descent, technical climbing, and a thrilling “waterfall” feature at the top. At five miles, it’s an approachable first ride of the year, and being shorter, you can ride one loop and link it up with Barrel, another enjoyable trail with jumps and drops. More information on the Zen Trail. This trail is a gem and should be on everyone’s bucket list. This 8.1 mile ride is adjacent to Bryce Canyon and lets you ride through some impressive hoodoos and red dirt. And you’re treated to some fantastic canyon views. While the scenery is stunning, the trail itself is a mixed bag of smooth singletrack, fast descents, and rocky turns. This trail can be shuttled or you can ride the Red Canyon bike path that is adjacent to State Road 12. The climb to the Thunder Mountain Trail is on a paved bike path and up a easy grade. However, it is five miles long. More information on the Thunder Mountain Trail. Everyone has already ridden Captain Ahab, and Porcupine Rim has too much snow on it. So instead, we’re going to point you toward the two-mile Jackson Trail, part of the Amasa Back riding area in Moab. This is a double-black diamond, experts only trail. Jackson is steep and twisty with multiple drops, boulders, and one particularly nasty section that even seasoned Moab riders walk. You’ll want a real trail bike for this ride and some strength. 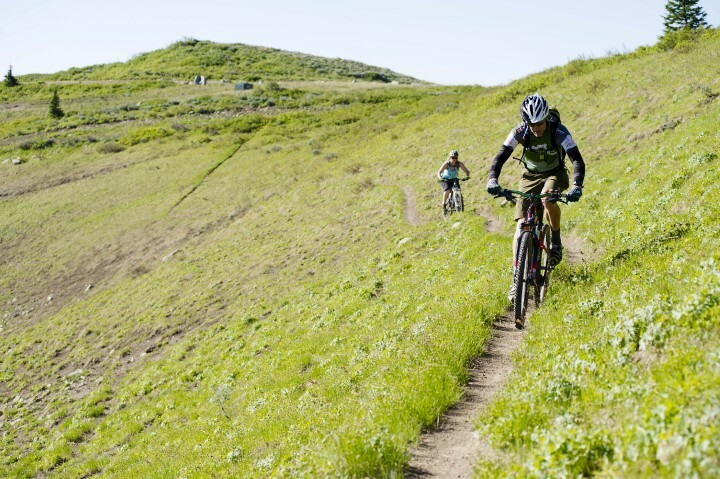 To access Jackson, you have to pedal up HyMasa and Cliff Hanger—two expert climbing trails. And your XC race bike won’t do it, we recommend a proper trail or enduro bike with slack angles for this ride. More information about the Jackson Trail. This four-mile trail is a good dust-off-the-cobwebs ride and you can link it up to other trails and loops in the Moab Brand Trails riding area. We like this trail because it’s sort of reminiscent of riding in Round Valley. It’s relatively smooth with bits of slick rock and technical moves. A good intermediate rider will love North 40 before moving onto more difficult trails in the Brand Trails network. Beginners can ride it too but may find some of the technical moves tricky and might want to walk them. It’s also easy to get to. As you’re driving 191 into town, the turnoff will be on your left and is one of the first riding areas you get to after Klondike Bluffs. More information about the North 40 Trail. This trail is closest to home and offers steady pedaling along the rim of the Good Water Canyon, or as some people call it, the Little Grand Canyon. The rim trail extends for 49 miles and has multiple start and end points—allowing for easy out-and-back rides. The trail is relatively flat, however, there are some technical bits that beginners may want to walk. The camping and views of the canyon and the San Rafael River are an excellent draw as well. A plethora of sites plus ample BLM land allows you to camp right on the canyon rim, near the trail. Want to make it a fun road trip? Take U.S. 40 to 9 Mile Canyon and check out Native American petroglyphs on the way. In fact, we did just that and wrote a blog about it so you can do it too. More information about the Good Water Rim Trail. So Where are You Going to Ride? This list was difficult to make as there is so much good riding in Southern Utah. Some readers may not agree with it and that’s ok. with us. Other areas you can explore are Gooseberry Mesa, St. George… Just get out there and ride your bike!